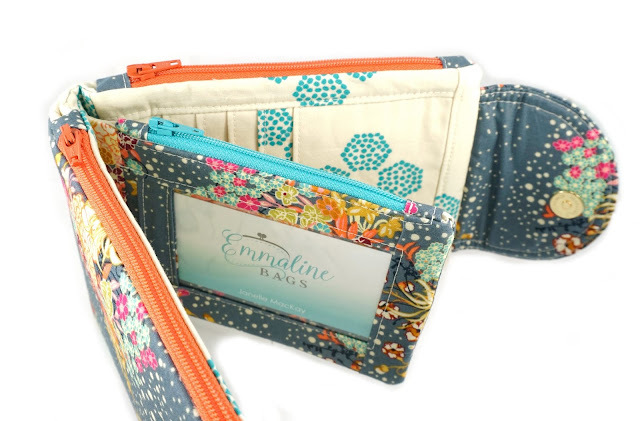 I've been waiting to blog about The Road Trip Wallet, released as the June pattern for the Bag of the Month Club 2018, because shortly after it was released with the club, I decided to add a second, smaller size, as well as alter the ID Pocket. I've finally done that, right at the 11th hour before the club season draws to an end, in just 6 days. So really now I'm just sharing my June contribution to the club right before the end! 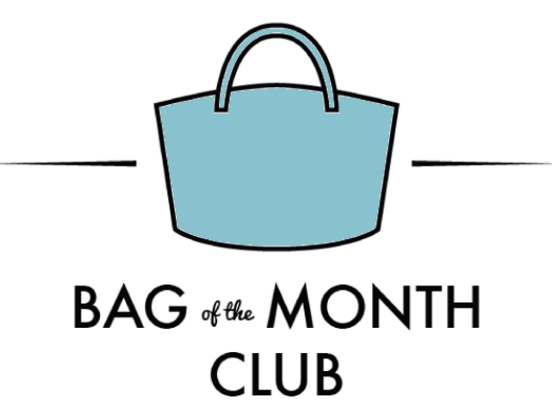 If you are a member of the club, you will probably already have logged into your account on the Bag of the Month Club website and gotten your download of the Road Trip Wallet. 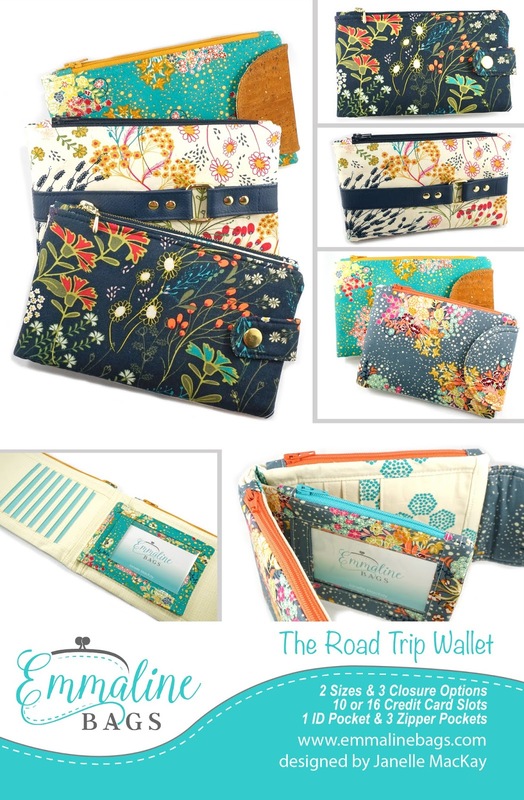 If you log in today, there will be an updated version for you, The Road Trip Wallet in 2 Sizes! 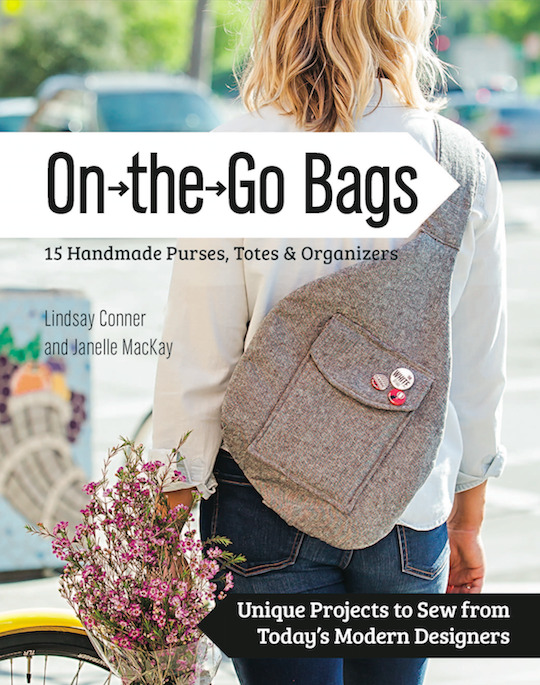 The Road Trip Wallet features 2 full-length zipper pockets that form the front and back “covers” of this book-like wallet. 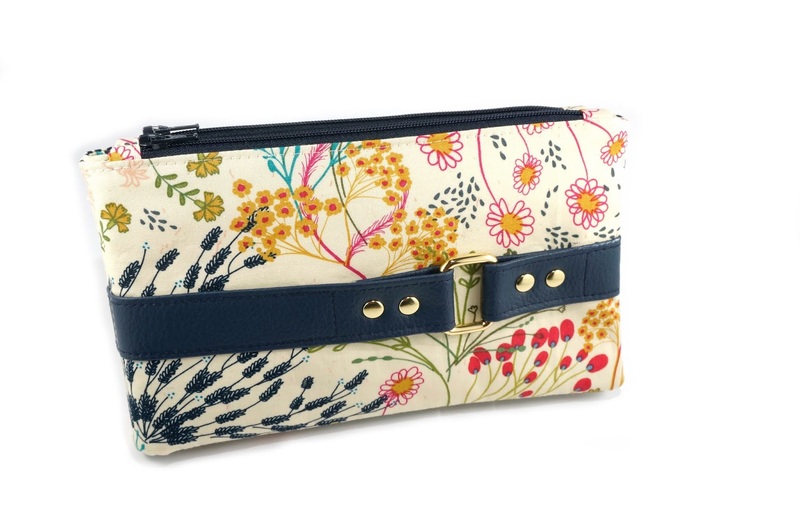 These covers flip open to reveal a center zipper pouch with an ID Window Pocket, and 2 sections of credit card slot pockets. The small size holds 10 cards, and the large, 16. Use my unique method to create the straightest credit card slots! 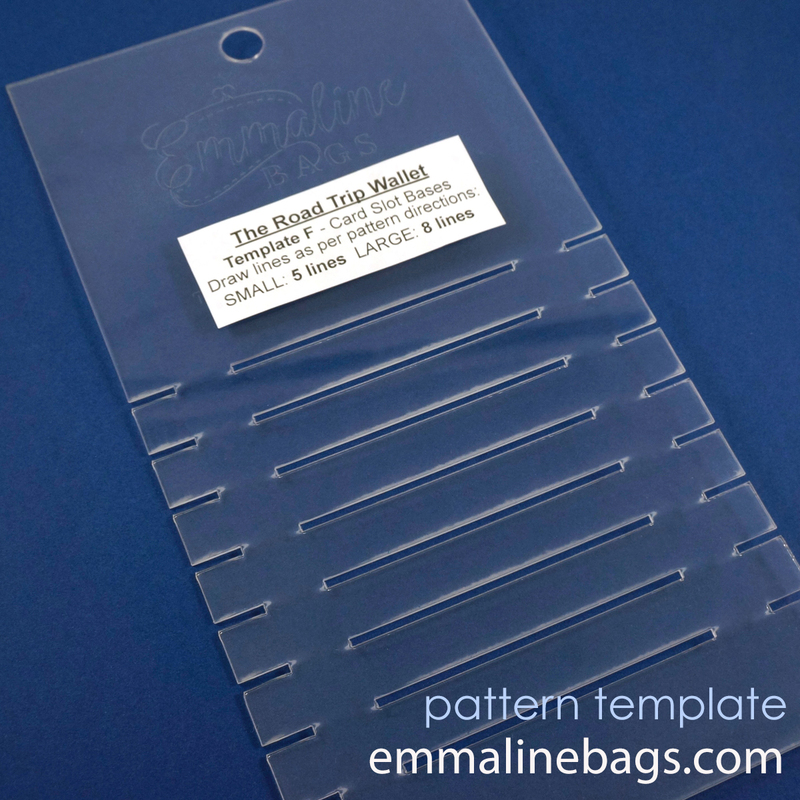 Draw your card slot lines quickly and precisely with our plastic template, available HERE at emmalinebags.com. 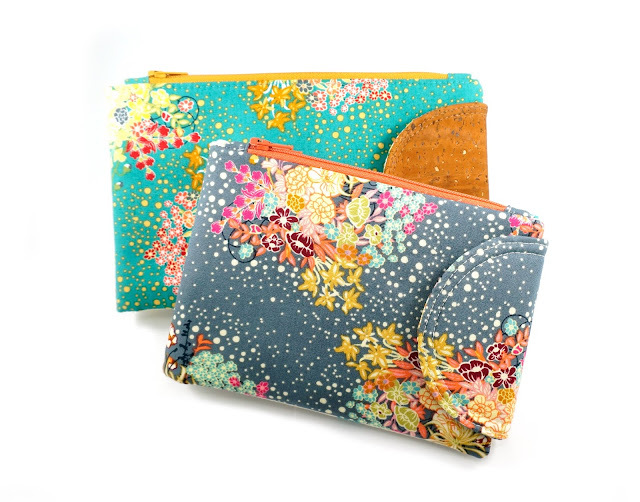 Choose from 3 versions of closures to finish off your wallet. Note: Version C works with the large size only because the ID Pocket interferes with the snap in the small size. Version A has a nice snap tab on the right. 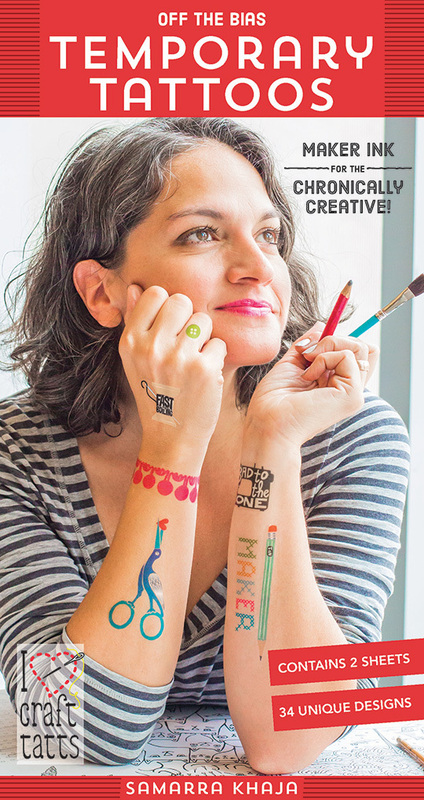 You can use a heavy duty snap for this. 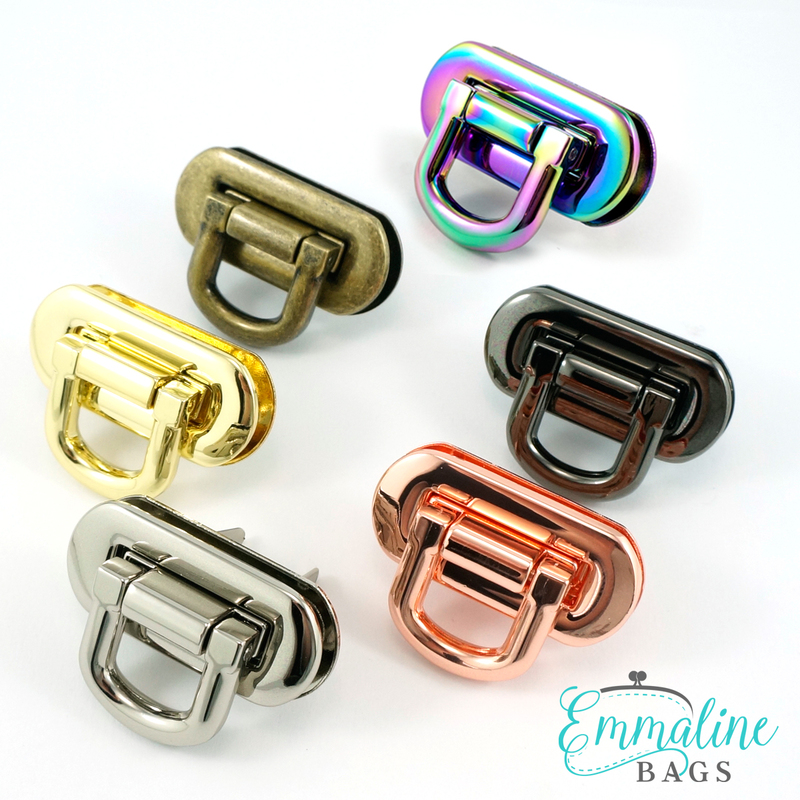 They go in very easily and come in a number of finishes. Version B closes with a nice firm rounded side flap and a magnetic snap. You can see it here in both the small and large sizes. 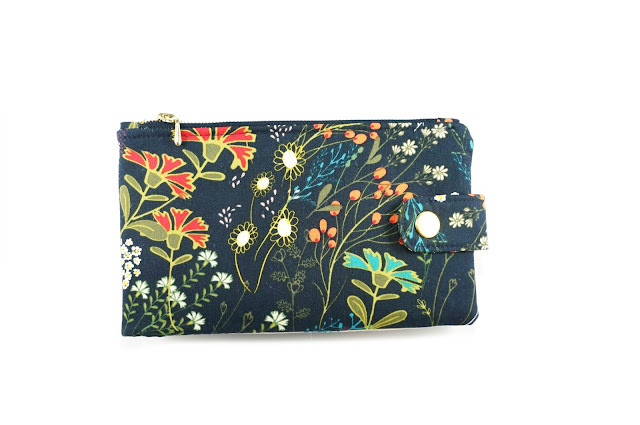 The small is 2" shorter than the large, so it fits in much smaller bags, and if you don't need 16 card slots, it might be handier for you! Version C shows off some very pretty and professional looking strap detail. It's a faux strap though, as it actually has a magnetic snap on the inside to close it. Because the internal ID pocket interferes with the snap, I do not recommend this version for the small size. The ID Pocket fits snuggly inside, and also has a zipper opening, perfect for your coins. 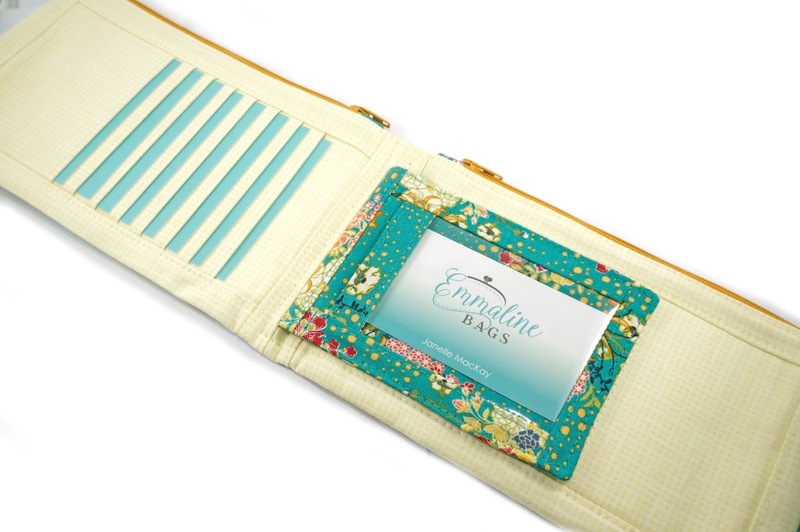 With 16 card slots in the large version, shown below, and 10 in the small. No card will get left behind. I've done the card slots a little tighter for this wallet, so there is no worry about them falling out! Card slot and ID Pocket open towards the center of the wallet for security. New card slots! In this pattern, I've come up with a new and unique way to may credit card slots out of fabric that does not involve any fan-folding, accordion folding, concertina folding - whatever you may call it! 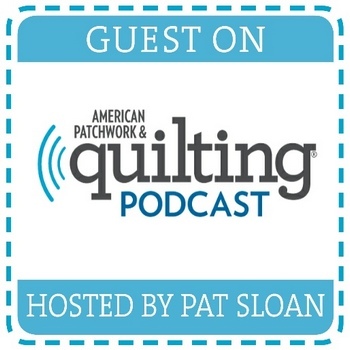 This method helps you create very crisp, accurate card slots that are thinner and have less interfacing and fabric to sew through than other methods. It does require you to draw lines on your fabric though, and I've thought of a way to make this a very accurate and easy process. With my plastic template, shown below, you can draw lines for both the small and large size and make sure they are straight and even spaced every time. 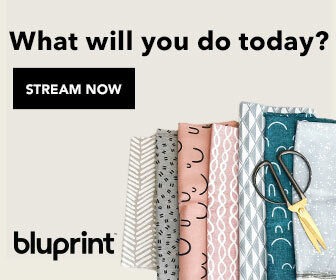 This will come in very handy if you plan on making wallets to sell. I see these being a great market stall item, giving the Necessary Clutch Wallet pattern a run for it's money! Get the template here. 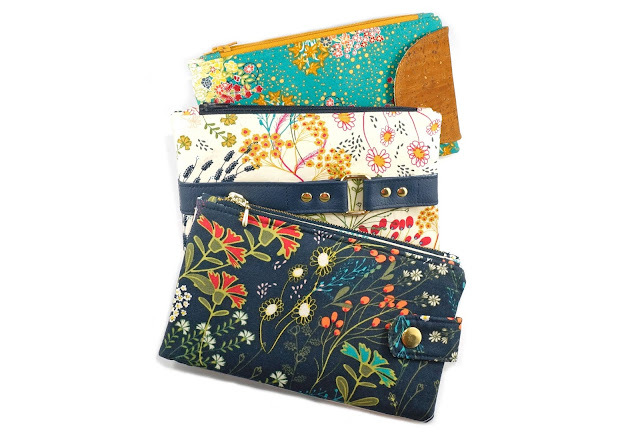 I've made all of the wallets shown above using the gorgeous "Indie Folk" collection of fabric by Pat Bravo of Art Gallery Fabrics. I love this earthy and romantic looking fabric. 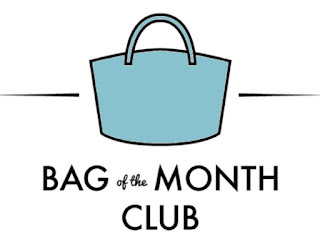 Bag of the Month Club 2018 - Wrap it up!